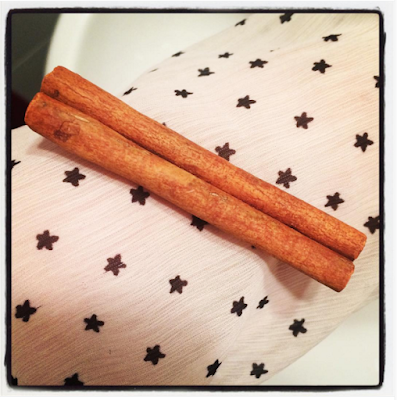 Today's pairing is cinnamon stick + star. Lucky for me, I have a shirt with a star pattern, which I think is quite pleasing. In creative risk-taking news, I want to tell you about a recent risk I've taken: While I like making new friends, sometimes I feel intimidated in the hockey department. I feel a little nervous to join the hockey mom fray in the stands, and I almost never go out for hockey parent drinks with the team. The people are all really nice. I just want to go home and wear my sweatpants, is the honest-to-goodness truth of the situation. But at last week's tournament, I took a risk and parked myself right in there with the hockey moms. When one of them suggested that we have a Powerball Pool to become billionaires, I agreed even though I'm not a huge lottery fan. I gave her five of my dollars. I'll let you know if we win. If we win, I will be forever bonded with these hockey parents. I'll never regret sitting next to them in the stands. I already don't regret it, actually. It was a nice risk to take. Yay for risk taking and stars and cinnamon sticks. I learned recently that if you throw down your hockey gloves, you're ready to fight. So be careful if anyone throws the gloves down.